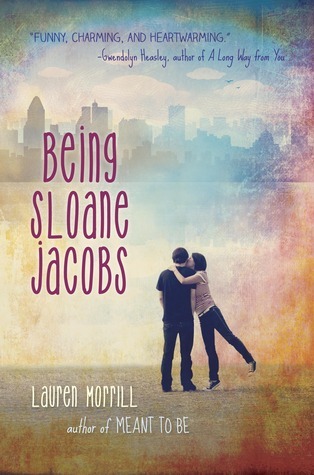 Sloane Emily Jacobs is a former competitive figure skater trying to make a comeback. She’s also the daughter of a senator with her life always on camera, and she’s seen more than she ever wanted to see. She’s off to figure skating camp this summer, unsure if she really wants to be there. Sloane Devon Jacobs is a hockey player that has gotten aggressive one too many times. Her mother is in rehab, her father’s out of work, and her only ticket to college is through hockey. She’s off to hockey camp this summer, unsure if she has what it takes to play well any longer. The idea of switching places, when these two Sloanes meet, is a way out for both. Hard, but they’re both convinced they’re getting the better end of the deal. Of course, nothing is as uncomplicated as that, and former friends, new friends, and new enemies are all determined to get in the way. I admit, I didn’t like this one nearly as much as I loved the last two Morrill books I read. I’m not sure why, really, except perhaps with two narrators, it was harder to cheer for the characters. There was less time for character development and story progression for both girls. I just didn’t get into the story nearly as much as the others. Then again, I had some personal connection to the other two (a swimmer on a study abroad program in the first, a cruise setting for the second…), and that might have made them more enjoyable for me. I didn’t really have a connection to anyone in Being Sloane Jacobs. In other words, I think my lesser enjoyment was purely me, rather than the book. Not much to say beyond that. This entry was posted in 2016, Prose, Young Adult and tagged humor, mini-review. Bookmark the permalink.